Glasgow Tigers descend on Armadale tonight scenting blood. It is the first home derby for Edinburgh Monarchs who are out to avenge their 57-34 defeat at Ashfield two weeks ago. Team manager Alex Harkess is still rankled by the heavy loss and also takes exception to it being described as a poor performance. He said: “People say you’re still top of the league but you were so poor, it just doesn’t make sense. Everybody has a bad result now and again. We went to Scunthorpe and won and Glasgow went there and lost; perhaps they should be asked why they suffered such a bad result there. Harkess does agree, however, that the visit of Glasgow presents Monarchs with a very significant challenge. “I think they’re the top visiting side to come to Armadale so far. The simple reason being that most of the Glasgow team have ridden our track so many times, that’s what it boils down to. “They have three very strong heat leaders who are capable of doing almost anything at our place. A threat comes from that kind of pedigree, and Glasgow are a very difficult team. Glasgow’s title credentials have been under the spotlight since that loss at Scunthorpe and Harkess added: “Glasgow will come with hope as we all do when we go to away tracks. Monarchs moved on to a more even keel with a workmanlike victory over Workington Comets last Friday and a deserved away point at Peterborough Panthers despite the absence of Erik and Mark Riss. “We got off to a steady start, and while our gating problems weren’t totally sorted out, it was better,” said Harkess. A danger man for Glasgow could be young Dan Bewley who rode for Monarchs in 2016 before switching to the Tigers this season. He scored a paid maximum in the Ashfield contest and certainly knows the quickest way around Armadale. Monarchs could make hay at reserve with Mark Riss potentially eligible for seven rides. “You would like to think we may have the upper hand at the tail-end because without question Mark is one of the best reserves in the league at the moment and will be very important to us this evening,” said Harkess. 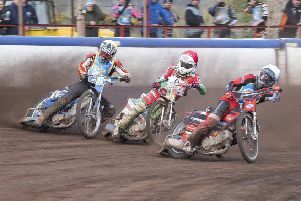 Heat leader star Ricky Wells is thirsting for revenge saying: “We have put the Glasgow match to the back of our minds now and we know we didn’t ride well. But the best way to respond to a defeat like that is to beat Glasgow at Armadale and make it a convincing victory.